ASOSU represents YOU, so don’t miss your chance to learn what this year’s president and vice president candidates have to say! Limited seating will be available live in KBVR-TV's studio on the SEC fourth floor, and you can also tune in to the live video on KBVR-TV's Facebook page. Be an informed voter by tuning in. 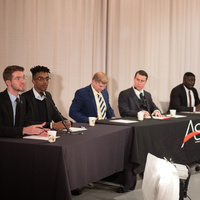 Click here to learn more about this year’s ASOSU elections. To request accommodations related to disabilities, please contact Drew Desilet with ASOSU at drew.desilet@oregonstate.edu or 541-737-8237.